Even if you’ve been Vail rafting before, it’s always good to have a refresher on rafting paddling technique before you jump out on the river. 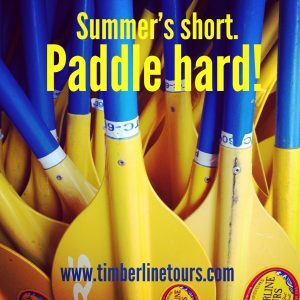 At Timberline Tours, our expert guides will give you a briefing before every trip that includes rafting safety tips, and paddling instructions will also be a part of your pre-trip meeting, but it helps to have a bit of advanced know-how. River rafting class difficulty often determines paddling intensity, and you may not even have to paddle on a Class II stretch of river, such as the Upper Colorado River, where guides often row oar frames and might only need your paddling help at higher water levels, in windy conditions, or through a few sections of smaller rapids. But your effort in paddling is vitally important on a Class IV stretch of river such as The Numbers on the Arkansas River. 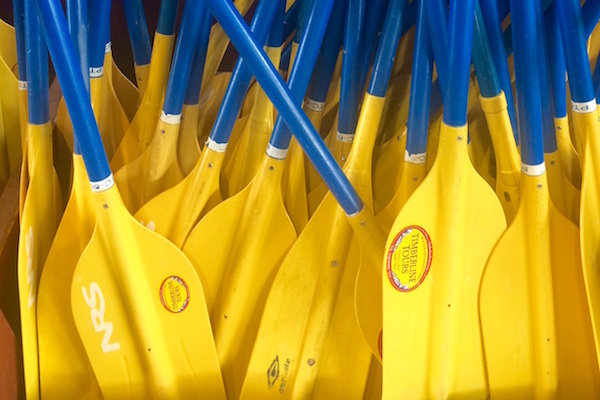 Generally, if you are rafting on a section of river that is Class III or above, guides do not use oar frames on these sections of river and depend on your paddling involvement for a successful trip. The T-grip, or the grip at the top of your paddle, can be dangerous if you’re not holding on to it properly. A paddle is basically a blunt object, and it can knock out teeth or cause head injuries if not handled properly. Even if you are going through calm sections of river, keep a hand covering the T-grip at all times–and, while you’re at it–keep your other hand on the shaft of your paddle so that you’re ready to respond quickly to your guide’s paddling instructions. Rafting guides shout out paddling commands that help your crew get safely down the river. Keep your ears alert and your mind sharp so that you’re not paddling backward when your guide has just instructed your side of the boat to take a forward stoke, for example. Guides will review common rafting paddling commands in the pre-trip meeting, but once you’re out on the river, it’s your job to stay alert and act quickly in response. Be listening attentively for your guide’s paddling commands, and make sure you paddle in sync with the others in your boat. The two front paddlers should be watching each other so that they begin paddling at the same time, and each person in the boat should follow the timing of the front paddler so that everyone dips their paddles into the water at the same time while keeping the same pace of the lead paddlers for maximum efficiency and power. You’ll wear out quickly if you take rafting paddling strokes with your arms only, so get your whole body involved, especially your core. Tighten those stomach muscles each time you pull against your paddle to engage larger muscle groups and to avoid burning out your arms before you reach the take-out. Paddle aggressively, but stop each stroke at your hip to keep the paddle in an area of maximum efficiency. Just as a railing helps you get up a flight of stairs, pushing and pulling forcefully into the water with a paddle will help keep you steady in a raft. Get that paddle down into the water even when you might be afraid and want to pull back. Your paddling effort is even more important in those high-fear moments. So instead of shying away from the huge splash or that massive wave rolling toward your boat, just dig in!